In 10-inch skillet, cook beef, onion, salt, cumin, coriander and chili powder over medium-high heat 8 to 10 minutes, stirring occasionally, until brown. Stir in tomatoes and chiles. Cook 3 to 4 minutes or until liquid evaporates. Remove from heat; cool 5 minutes. Spoon beef mixture into lettuce leaves; top with cheese and green onions. Want more toppings? Try sour cream, hot sauce, pickled jalapeños, chopped cilantro, sliced ripe olives or some of each! Be gentle when stirring in the tomatoes and chiles. 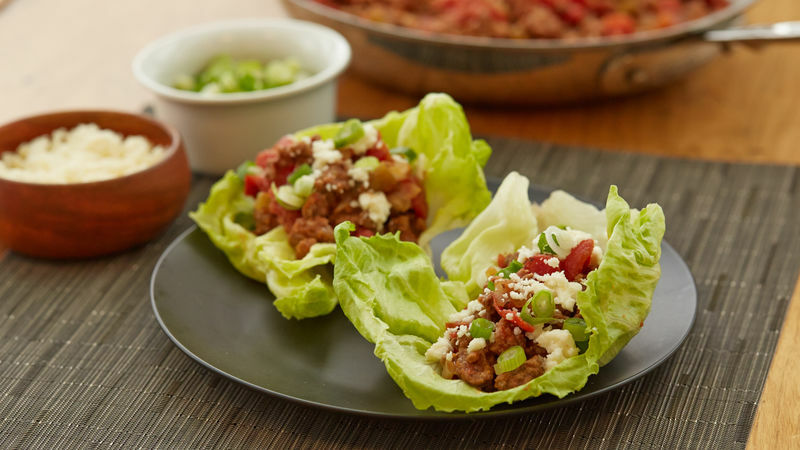 For a thick and chunky texture that’s perfect for lettuce wraps, don’t press too hard.